I have probably mentioned this many times, but unfortunately I hate pickles in general. I wish I liked them. And, obviously, Korean kimchi is one of them. 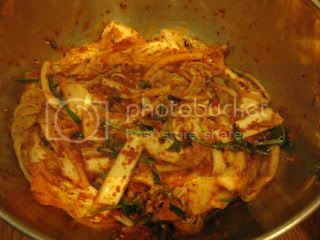 But, I discovered in my last trips to Seoul that I can handle freshly-made kimchi, or I even really liked some of them! I still cannot stand aged (with strong fermented flavor) kind, but if it's only the first or second day since it's prepared, I'm good. 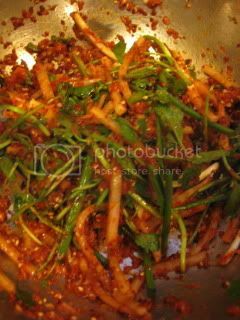 And, I really enjoyed learning how to make authentic kimchi in my last visit in Seoul. 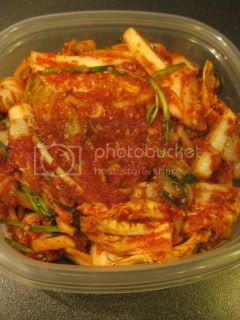 So, here's my napa cabbage kimchi...which I enjoy eating on the first day it's made. 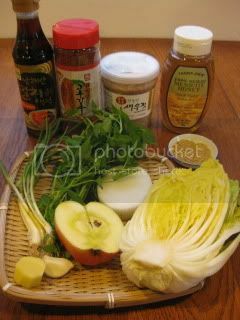 When it's a little older, I can use it for making kimchi jjigae (kimchi hot pot) with donabe. 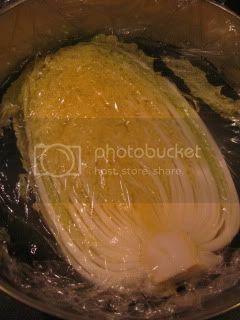 For napa cabbage (medium-size), I cut it in half and soaked in salt water (1C salt was dissolved in about 2L water) overnight. Then, it was drained and rinsed throughly for 3-4 times. 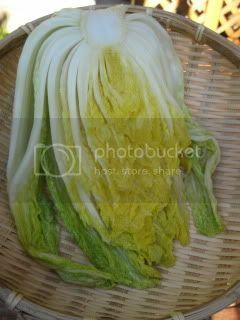 After rinsing the napa cabbage and lightly pressed to drain more water, it was sun-dried for a day. 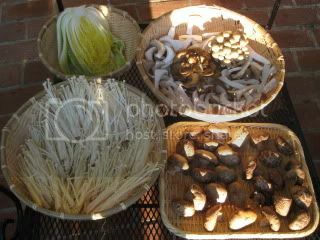 My happy napa cabbage enjoyed sun-bathing with my mushrooms (which are for other purposes). 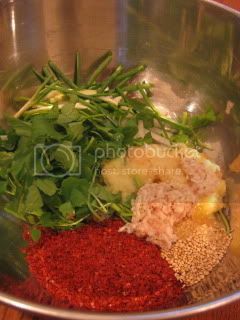 To make yangnyum paste (to mix with napa cabbage), I got anchovy sauce (1T), red chili pepper flakes (3-4T), salted baby shrimp (2.5T, then minced), honey (1/2T), ginger (1 knob, grated), garlic (1 clove, grated), apple (1/2 medium-small, grated), baby scallion (2-3, cut into 2" length), minari (dropwort, several stems, cut into 2" length), daikon (3 oz, cut into 2"-long thin match-sticks), sesame seeds (1T), and brown sugar (1 tsp). 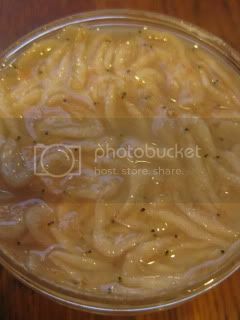 Baby shrimps are very salty, so I made sure to drain the liquid well before mincing them. 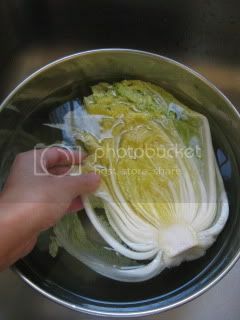 For aging kimchi, you rub the yangnyum paste between the leaves of half napa-cabbage. 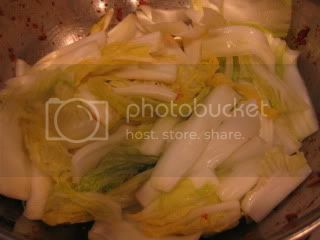 But, since I am making it for eating soon, I already sliced the napa cabbage and simply tossed them in the paste. My homemade kimchi is ready! It's so tasty...homemade is the best way.